Create, publish and share media-rich notebooks; server version available. Is there a better alternative to NoteShare? Is NoteShare really the best app in Word Processing category? Will NoteShare work good on macOS 10.13.4? NoteShare is a powerful desktop application for creating, publishing and sharing media-rich, multi-page notebooks. 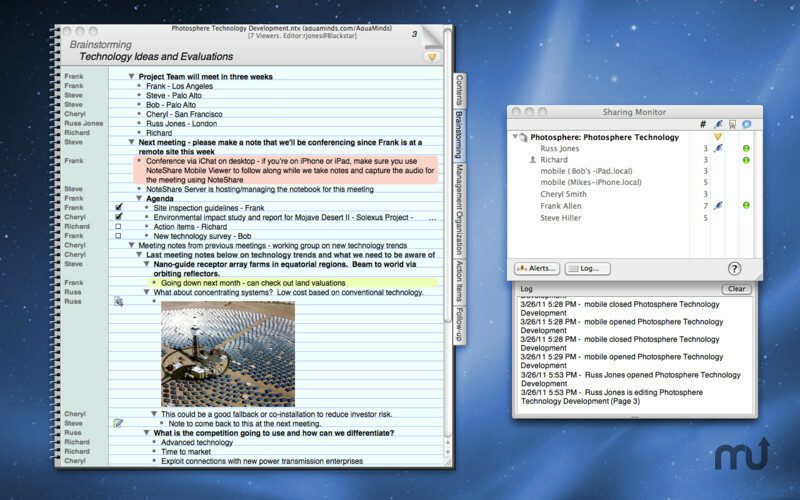 Users can instantly share their notebooks with other NoteShare users for presenting, viewing and editing information. NoteShare can be used in the same room, same building and globally for connecting anytime, anywhere. NoteShare needs a rating. Be the first to rate this app and get the discussion started! Sharing means that the information in a shared notebook can be viewed, edited and modified by other NoteShare users. Any NoteShare user can share a notebook from their own personal computer and allow other NoteShare users to access, view and edit it. With NoteShare, you don't need to use a third party hosting service or server, just two or more users to start sharing and working on the same notebook. NoteShare is an ideal collaboration tool for users who work on team projects or have a need to share notebook information with one or more users in a small group or classroom. NoteShare serves a growing, dynamic community of users including students, educators, researchers, scientists, doctors, designers, authors, directors, producers, consultants and many other creative fields. NoteShare allows multiple users to work on a single shared, interactive notebook from the same room, same building or even from a remote location via the Internet or a network gateway. NoteShare enables home and small office users to work on their notebooks remotely while away or in a different location than from where the notebooks are being shared. Presenting, viewing and editing a shared notebook can be done on-demand as needed. Any NoteShare user can view other shared notebooks as well as share their own notebooks.